24 hour emergency dentists are helpful for all those who often find themselves facing dental problems in some form or another. They might range from being slightly painful to downright agonizing. Thankfully, if your situation happens to occur at an odd time, you have emergency dentists or 24 hour dentists all around you, each better than the last. Along with being the name of one of Charlotte Brontë’s book characters, Rochester is also home to a good 110,000 individuals. Serviced by three main highways, Rochester has its abundance of attractions that provide arts and entertainment to the residents. 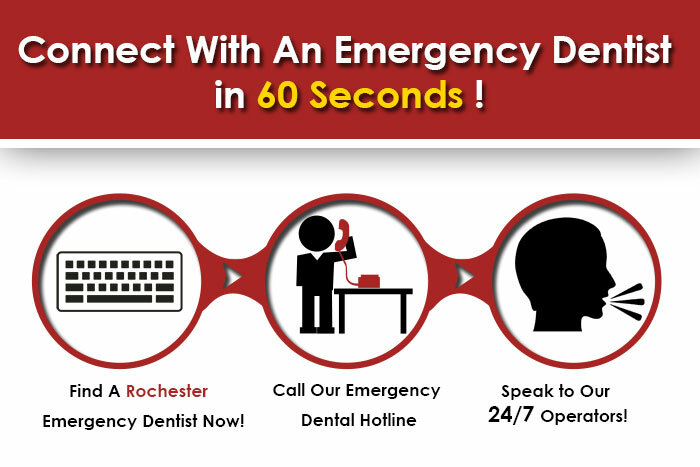 The number of available dentists and dental care units available within Rochester are enough to take care of everyone’s dental issues with ease. Call at 507 377 5033 to get in touch with the team of this elite team of dentists. Their office hours are from 8.00 a.m. to 5.00 p.m., from Mondays through Fridays. Uptown Dental offers a few free services, such as: dental implants consultation, second opinions, teeth whitening procedure, cosmetic dentistry consultation and braces consultation. Their skills are clean and fast, including the following procedures: Cavitron ultrasonic teeth cleaning, family dentistry, fillings, intraoral camera, 6 months braces, dental phobia and much more. You could take a quick virtual tour of their office, getting a gist of the facilities that the Family Dentist Tree dental care unit has to offer. Dr. James Watson leads this unit’s team, restoring and maintaining the happy and healthy smiles of past and present patients. The combined experience of the dentists make up over 75 years, which ensures that the work done at this dental clinic will be as good as can be expected. The Family Dentist Tree makes use of amazing technology to provide their patients with comfort and quick treatments and procedures. To get in touch with them, call 507 288 1188. Call at 507 288 7379 to get in touch with the staff of the Gentling Dental Care center who are brilliant at what they do, mostly because they have been practicing since the 1940s. Their website contains statements of several patients who are satisfied with the work that has been done on their teeth.This dental care center is open on Mondays, Tuesdays, Wednesdays and Thursdays from 7.00 a.m. to 5.00 p.m. On Fridays, patients could go in at any time between 7.00 a.m. and 12.00 p.m. For busy people, lunch time appointments have been made available too. A dental care center that offers specials for new patients and a bunch of services at affordable prices, Northpointe Dental could be reached through a call at 507 281 3548. Some of their procedures include sealants, whitening, implants restorations, composite fillings and periodontal treatment. If you happen to have queries, you could take a peek at their website and go through their Q&A section.